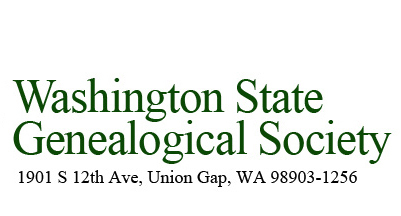 Washington State Genealogical Resource Guide, by Kathleen Allen O'Connor and Charles Hansen. Washington State Digital Archives - The nation's first archives dedicated specifically to the preservation of electronic records from both state and local agencies that have permanent legal, fiscal or historical value. Washington State Dept of Health, Center for Health Statistics, PO Box 9709, Olympia, WA 98507-9709. Holds state vital records since July 1, 1907. Spokane Public Library, 906 W. Main, Spokane, WA, hours M-Tu, 12-8, W-F, 10-6. Info number 509-444-5336. Librarians at this number CANNOT answer genealogy questions, but.....EWGS has volunteer genealogy helpers in the Genealogy Room on Tuesdays, 10-5. Call SPL on a Thursday and ask for the Genealogy Room. Seattle Genealogical Society Library, 6200 Sand Point Way NE, Seattle, WA [across the street from the National Archives]; Open Tues - Sat 10 am to 3 pm; Sun - 1 pm to 5 pm, free to the public. Call 206-522-8658 for more information. WA State Dept. of Archeaology and Historic Preservation - advocate for preservation of Washington's irreplaceable historic and cultural resources. The WSGS Education Committee is putting together information about the LDS Family History Centers in Washington State, including location, driving directions, hours, phone, and collection information. We hope it will be of help to you with your research. Clickable map! To locate a Family History Center, click on your area of interest on the map at left, or use the links below. Civil War Veterans - The goal of this project is to have a comprehensive list of all Civil War veterans resting in Washington State soil, along with a short biography of each. Anyone with a Civil War veteran ancestor buried in Washington is encouraged to contact Bruce Smith at smith.bruce123@comcast.net.